Grammar has a terrible reputation. We all live in fear that we have forgotten one or other grammatical rules. During my work as a writing coach, I’ve seen successful, confident clients flinch back, staring at me in anxiety, if I mention a term that sounds even vaguely grammar-ish. And I completely understand. Even when it is useful, this kind of grammatical correction is always annoying. 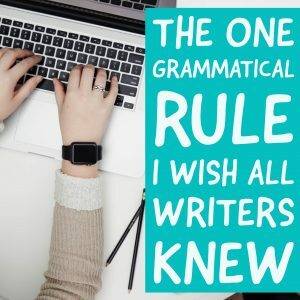 However, I believe that there is at least one rule of grammar, or one area of grammatical know-how, that is actually very important and useful. Knowing about it will measurably improve your abilities as a writer and editor. Maybe you dislike grammar now. That’s okay. I promise that by the end of this post, you will be impressed by this one technique. You may even be excited to share these ideas with your friends, colleagues, and rivals. Recently, I started listening to English Grammar Boot Camp, an audiocourse from The Great Courses, taught by the linguist Anne Curzan. If you are a teacher of writing, or an author, or just someone who cares about language, this course is well worth trying out. And yet, listening to Curzon speak, I sometimes felt frustrated. In her “bootcamp,” it might seem like the only reason to care about “grammar” is a fear of the red pen. It’s as if you only need to worry about grammar if you are engaged in a lengthy email exchange with Chief Justice Roberts, and you are afraid of making a mistake. But that’s not how I see “grammar” at all. To me, there are principles of grammar which are generative: they guide us to create writing that is easier to read, more distinctive and more individual. I believe that a certain amount of grammatical knowledge can make you a more fluent, natural writer. And among all others, the one piece of grammatical expertise I encourage my students to focus on and deliberately practice is this: their skill with the clause. To me, this is the one piece of grammar that native speakers do not instinctively understand when they write, but which, if used carefully and forcefully, can genuinely upgrade your writing skills. Well, I’m about to explain, but first, I want to warn you. It will sound really basic and obvious at first. You’ll feel like I’m repeating stuff you learned in little kid school. But that’s just the start. I’m going to demonstrate, quickly, how these ideas can improve your writing. When we English readers begin a new sentence, we are instinctively looking for two things. Before we get those two things, we are unsure, uncertain. Once we have them, we relax, and get back to our reading ease. This only takes the smallest fraction of a moment, of course, but we are still working during that time. Without knowing it, we are looking for a subject and a verb. That is: a person and the action that person is taking. The returns are higher for online courses. Unfortunately, critics have misunderstood Kubrick’s intentions. A subject and a verb (the verb is also called, more technically, a “predicate”). Together, those two elements form a clause. There’s probably a lot of other stuff going on in your sentence, but a clause is still the crucial component. A clause is like the engine of the sentence. The basic grammatical rule states that every full sentence needs one clause. You can have more than one clause, but one is necessary. This premise suggests that in every sentence you write, you want to deliver the first clause, the first subject + verb pair, as quickly as possible. It suggests that as a reader starts each sentence, she is instinctively looking for a subject and a verb. Sentences that give her that pair quickly will seem to easy to read; sentences that delay or muddle the pair will seem like harder work. Whenever you can, put the clause at the start of the sentence. Or: if you cannot place the subject-verb pair at the very front of a sentence, you want to make the preliminary material, before the clause, very simple and easy to read. One single, clear, “chunk” before the main clause begins. Why? Because if the pre-main-clause stuff in one of your sentences is long, rambly, or even vaguely hard for a tired reader to parse – rewrite. Yuck. I’m not even sure you noticed the verb when it finally arrived. Rewrite. The sentence-theorist Francis Christensen surveyed a range of twentieth century novelists and essayists, and he found that these writers generally stuck to a “subject-verb” sentence opening 75% of the time. For every four sentences, three began with the simple “subject-verb” pair. One in four seems a nice variation from the rule. You don’t just want the subject-verb pair at the front. You also want to keep the subject-verb pair as short as possible. I’m not saying you should write short sentences. Hell no. You should, however, work hard to keep the subject-verb pair at the start of each sentence as short and simple as possible. Don’t tax the reader’s brain when she is simply trying to work out what is happening. Nora Bacon, in The Well-Crafted Sentence, describes how to do this at length. But the simplest technique she suggests is to make sure your clauses are “populated” (her phrase). In other words: seek out real actors for your clauses. Try to make sure the subjects of your clauses are actual people, and not abstract ideas or forces. The more you work in real people into your clauses, the fastest you are likely to deliver that clause. Ugh. We have to wait so long to find out what the verb is! Worse, in both cases, the verb, when it finally arrives, is limp and bland. It’s as if the long subject phrase wore the writer out just as it confuses and bores the reader. Instead, find a person who could be doing the action of that sentence, and make her the subject. This will almost always result in a better sentence. PS Scientific writers are particularly in danger here. Many scientific and technical documents fill their sentences with long abstract subjects, leaving the verb of the sentence stranded between a series of vague impersonal forces and a long list of consequences. It’s hard for a reader’s eyes not to glaze over. Can you rewrite that sentence? Replace the ten-word subject with something more alive — and much shorter. So. That’s the first reason why clauses matter. But there’s more. I’d like to keep talking about this in a future post. I want to talk about how clauses combine — illustrated with a masterclass from Ernest Hemingway. And then I want to talk about how we add extra pieces, within the sentences, to our clauses, for maximum speed and effect. You should also take a look at my free guide to writing style, How to Write Better Sentences. It touches on these topics as well as many others. Why should you care about grammatical rules at all? Here’s one answer: we all worry about our writing, and a good rule like this helps you focus on the right things. We all absorb writing advice, one way or another, so it’s crucial to get good advice, especially good grammatical advice. Otherwise, when you seek out a goal like “simplicity,” your writing will be simple where you don’t need to be simple. And you probably won’t catch moments of real complexity that annoy your readers. Here’s one example. Many people who offer writing advice on the Internet advise you to write in the simplest, briefest possible sentence, as to avoid confusing statements and complex claims. I’ve even seen one site that advises writers to avoid commas altogether. That particular blogger argues that whenever you are inclined to use a comma, you should instead end the sentence. And start a new one. To me, this is well intentioned but crazy advice. Let me quickly show you two passages: one is longer, and has a lot of commas. The other has no commas at all. Which passage do you find the most memorable, the most intriguing? The masked man lunged forward, grabbing my arms, using his massive height and weight to slam me against the cellar wall, knocking the air from my lungs, making my vision blur and dim. Fortunately, I was a werewolf. The experiment of working through the live process of implementation as a whole-group team was troubling for stake-holding employees. Option two lacked a single comma. And it was shorter. However, it also had an abstract, inhuman subject-phrase of over ten words leading to a dull, weak verb (“was”). Which passage lingered more in your mind? Thankyou Daniel .It was quite helpful .You are absolutely right in saying that we need to polish and polish our grammar all the times . Very good advice Daniel. I am working on my 1st book and quite often forget this important rule. Thank you, Belinda! What’s your book about? I hate grammar. Not because I don’t think it is unimportant. I hate it because every time I think of grammar I think of my 7th grade English teacher, a horrible wicked-witch who hated kids, screaming at all of us about sentence diagrams and how critical it was. And how we were all idiots. She literally had a dunce cap. I’m not kidding either. She had one. However, I am coming around and trying to learn more and more about grammar and how it can be our friend and not the literary essence of all things evil. Thank you for this post. It was very useful. I am event going to check out that course on GCs. Hey Bryan I hate that stuff too. I find it exasperating. Plus — the truth is all native speakers of a language know “grammar.” That why no one ever writes ‘The dog blue ran tomorrow.” Anne Curzon’s course makes this case very convincingly. There are just a few odd cases where our instincts let us down… and there are skills that help people build up more options when they write. Thanks for reading.